Ron Hungarter investigates black mold - mixing outlet vents. When I advise people not to mix different types of outlet vents, I always get the same look of confusion and disbelief. "More is better" is an understandable human impulse, but is dead wrong in this instance. As most of you already know, the best way to ventilate a home is to install continuous soffit inlet vents and continuous ridge outlet vents. What you haven't heard, perhaps, is that mixing outlet vents is a serious mistake. By the immutable laws of physics, the outlet vent with the greatest rate of flow converts to the weaker outlet vents into additional inlet vents. This eliminates the ability to draw air through the soffit vents - and airflow is essential for dry sheathing, a healthy home and a healthy homeowner. Investigating the home shown here, we found a roof with two types of outlet vents: gable end vents and a centrally located power attic ventilator. Like water running downhill, airflow always seeks the path of least resistance. When the power attic ventilator switched on in this one-year-old room, it sucked air through the gable end vents instead of drawing it up from the soffit vents. True, air is still flowing, but not where is should be. Instead of traveling up along the roof's sheathing from the soffit vents, it's flowing in from the gable vents and right up through the power ventilator. Consequently, it is not carrying water vapor away from the roof sheathing, but straight into it. 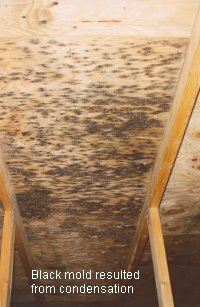 This is a perfect medium - dark, moist, nutrient-rich plywood, with its glues, and wood and other organic matter - for mold, mildew and sometimes wood rot. It won't take long for another type of life - lawyers - to show up as well. Notice in the picture that the mold growth decreases towards the apex of the roof. This is because the apex has the most air flow, in from the gable end vents and out through the top, center power attic ventilator. Energy costs and conservation have us building tighter and tighter homes, but unfortunately, a tight home is not necessarily a healthy home. Add to this the fact that many contractors are not aware of the critical importance of proper attic ventilation, and we have a recipe for disaster. When you are choosing the types of outlet vents you want for your next project, remember that less is more. Specifically, one type of outlet vent is all you need. �01 - 2004 Ron Hungarter Associates, Inc.
�01 - 2011 Ron Hungarter Associates, Inc.